Nigeria will be holding presidential and parliamentary elections against a backdrop of negative sentiment in the country about the state of the economy and political system. These attitudes were evident in a Pew Research Center survey conducted in the summer of 2018. Nigeria is home to the largest population in Africa, which is almost evenly split between Muslims and Christians. Incumbent President Muhammadu Buhari of the All Progressives Congress (APC) will be running against multiple candidates including former Vice President Atiku Abubakar of the People’s Democratic Party (PDP), John Gbor of the All Progressives Grand Alliance (APGA), Usman Muhammed of the Labour Party (LP) and others. 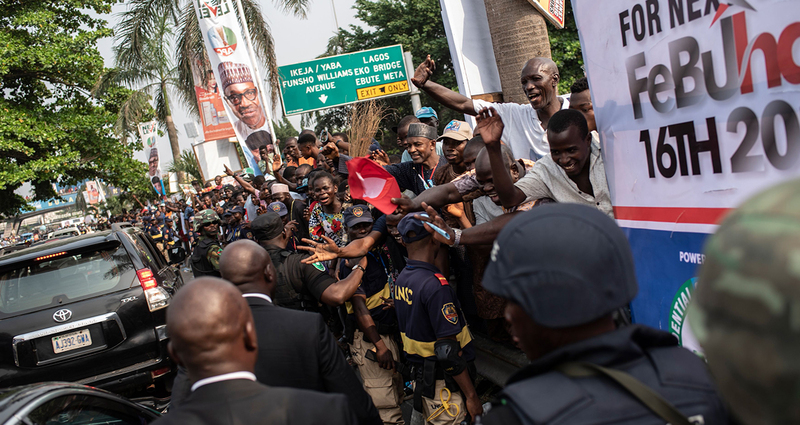 Tensions in the country have grown in the final weeks before elections because of Buhari’s controversial decision to suspend the country’s chief justice. These five charts capture the Nigerian public’s mood about the state of their nation and the differing attitudes of the Muslim and Christian populations. 1 Few Nigerians are satisfied with the state of their democracy. Only 39% of Nigerians are satisfied with the way democracy is working in their country, while 60% say they are not satisfied. This negative sentiment is similar to what was found in 2017 but is slightly improved from 2013, when Goodluck Jonathan was president and 72% were dissatisfied with the way democracy was working. 2 Many Nigerians are skeptical about the country’s political and judicial systems. Almost six-in-ten (59%) say the statement “elected officials care what ordinary people think” does not describe their country well. In addition, a 57% majority believes that no matter who wins an election, things do not change very much for people in Nigeria. 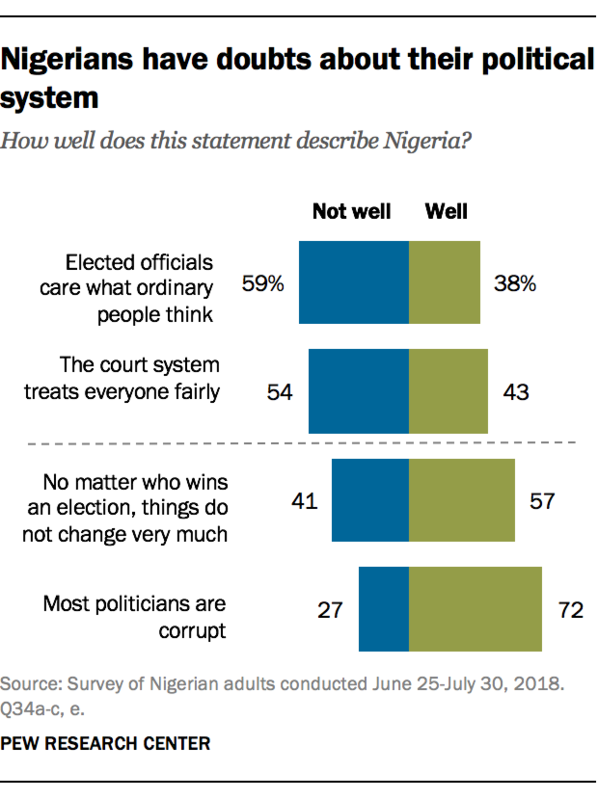 Roughly seven-in-ten Nigerians (72%) believe the statement “most politicians are corrupt” describes their country well, and fully six-in-ten say it describes Nigeria “very well.” Still, a 2017 survey by Afrobarometer, an African research network, found that 54% of Nigerians agree that ordinary people can make a difference in the fight against corruption. Over half (54%) do not think the court system treats everyone fairly, the Center’s survey found. And according to Afrobarometer, a quarter of Nigerians don’t trust courts of law at all. 3 There is a wide gulf between Christians and Muslims in their views of the political system. 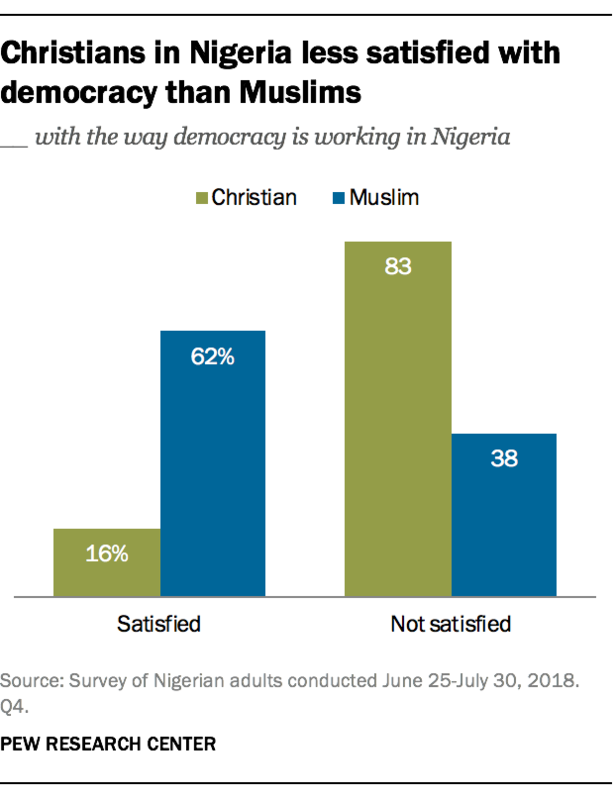 Only 16% of Christians in Nigeria are satisfied with the way democracy functions in their country, while a large majority (83%) is unsatisfied. Meanwhile, 62% of Muslims are happy with the state of their democracy, and 38% are unsatisfied. Satisfaction among Muslims has dropped slightly since 2017 (when it was 68%) but is much higher than in 2013 (33%), when there was a Christian president. The share of Christians who are satisfied with democracy, however, has decreased slightly since 2013 (22%). 4 Views of the two largest political parties vary sharply by religion. Both the APC and PDP are popular among Nigerians, with 50% and 57% favorability ratings, respectively. By comparison, 28% of Nigerians rate the LP favorably and 24% have a favorable view of the APGA, though roughly one-third did not give an opinion of either party. 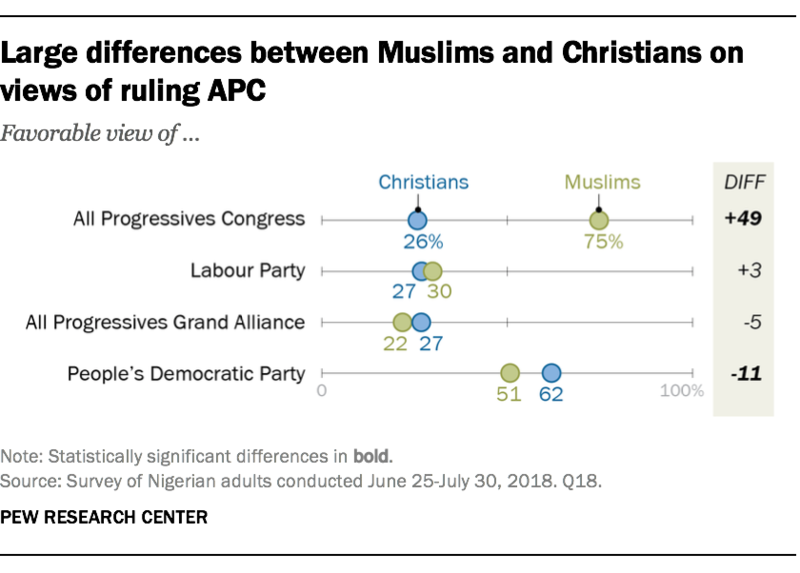 Nigerian Muslims (75%) view Buhari’s APC much more favorably than Christians (26%). Conversely, 62% of Christians and 51% of Muslims have a favorable view of the PDP. There are no differences between the two groups in their views of the other parties included in the survey. 5 Over half of Nigerians still describe the economy as bad, but economic sentiment has rebounded since the 2016 oil recession. 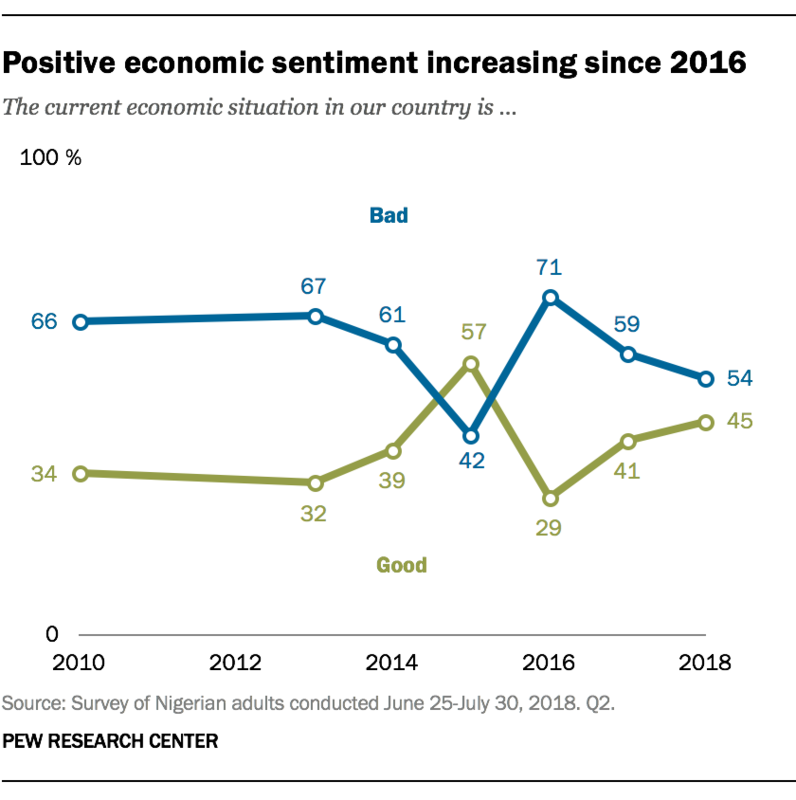 As of summer 2018, 54% of Nigerians described the economic situation as “bad,” down from a high of 71% in 2016. And 45% rated their economic situation as “good” last year, an increase of 16 percentage points since 2016 (29%). Nigerian Muslims and Christians are split on perceptions of the economic situation; 62% of Muslims say the economic situation is good, while only 29% of Christians share that view. Note: See full topline results (PDF) and methodology here. Christine Tamir is a research assistant focusing on global attitudes at Pew Research Center.